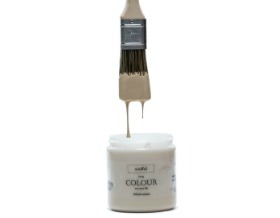 Are you ready to paint it blue with Velvet Finishes September colour of the month, Modern? You’re right, but Modern was the first color I created. It’s special. 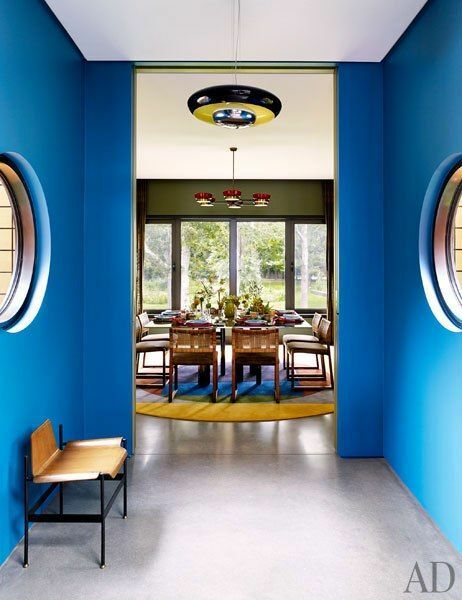 Modern is a strong, bold color. Just like a gorgeous sapphire. 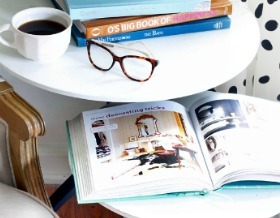 It’s contemporary, cutting edge and fresh, but is rooted deep in traditional palettes. 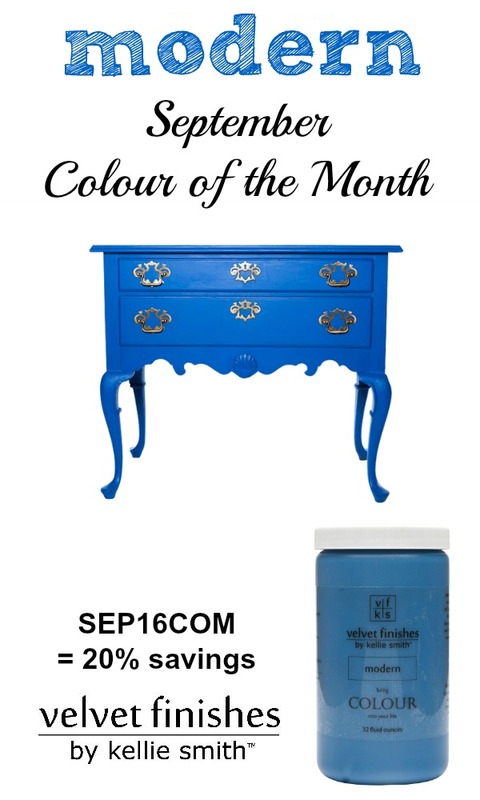 So to get you excited about The September Colour of the Month, I’m going to share a little blue inspiration! This is a piece that we painted with Velvet Finishes Modern. I think it turned out quite lovely! 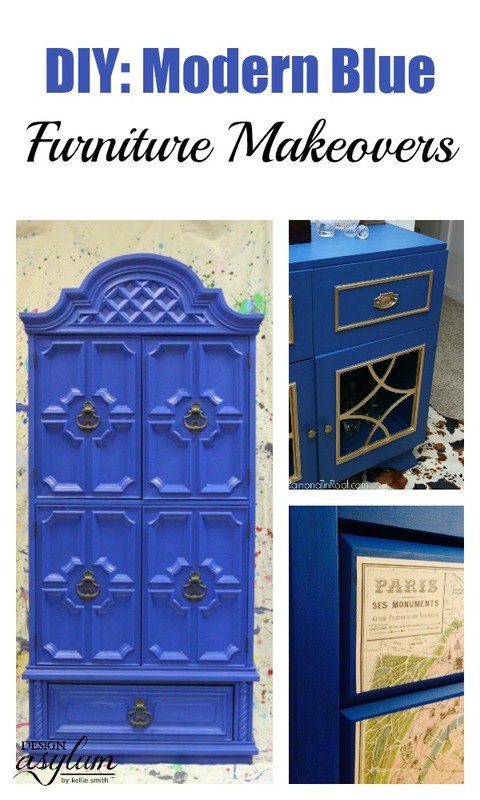 Jenna from Rain on a Tin Roof transformed a vintage radio cabinet into a BAR! I mean how cool? This piece was painted with Velvet Finishes Modern. 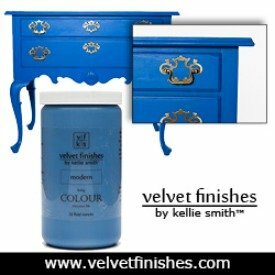 Take a look at this amazing furniture upcycle that we did using Velvet Finishes Modern! We transformed this 70’s wardrobe into a functional craft cabinet – boy was this one fun to do. 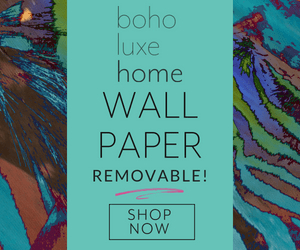 Go here to see what we did to the inside, hint: vintage wallpaper + DecoPaste! Add a pop to your kitchen with a blue island! 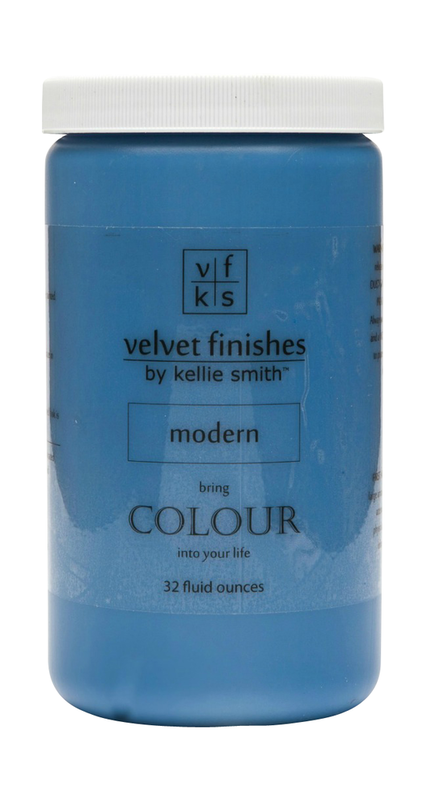 Achieve this look with Velvet Finishes Modern! 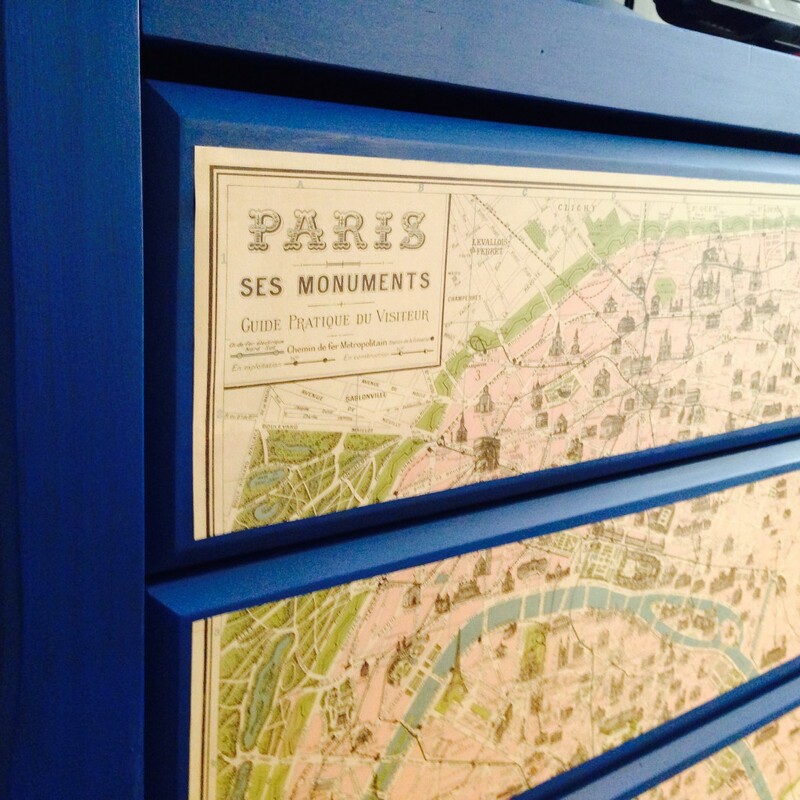 Below is a piece that Sam from House of S. Jaye did using Velvet Finishes Modern! 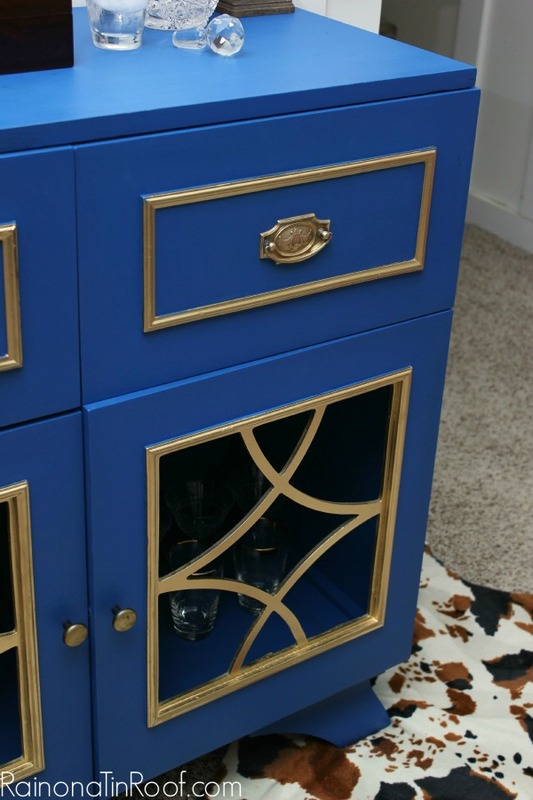 The color is amazing, but that arrow handle… Check out her Facebook page to see more fabulous furniture flips! We are crazy about what Mariella from Cottage Made did with this changing table using Velvet Finishes Modern! Isn’t the map detail a great idea? 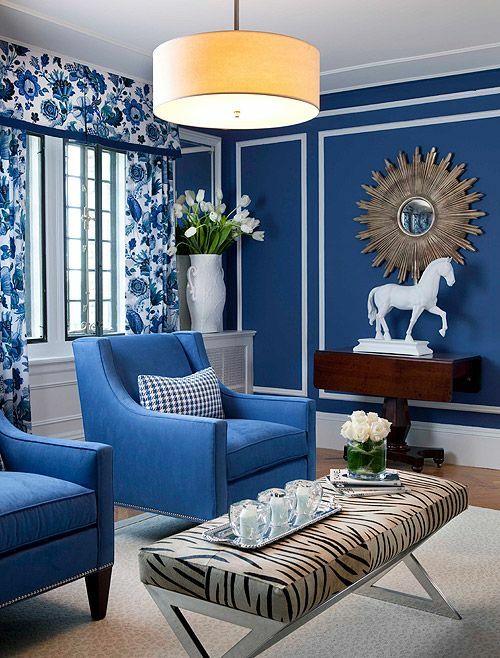 Now, let’s take a look at how we can incorporate this modern shade of blue into our decor! 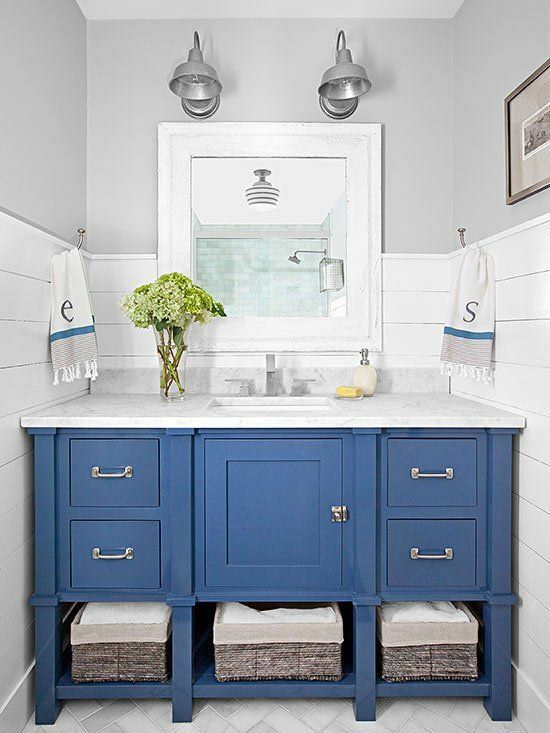 Blue is a popular color because it works well in any setting and is gender neutral. A blue & white fabric with birds and flowers, like those pictured below, looks lovely as drapery and is subdued enough to be paired with other patterns like checks and zebra stripes. 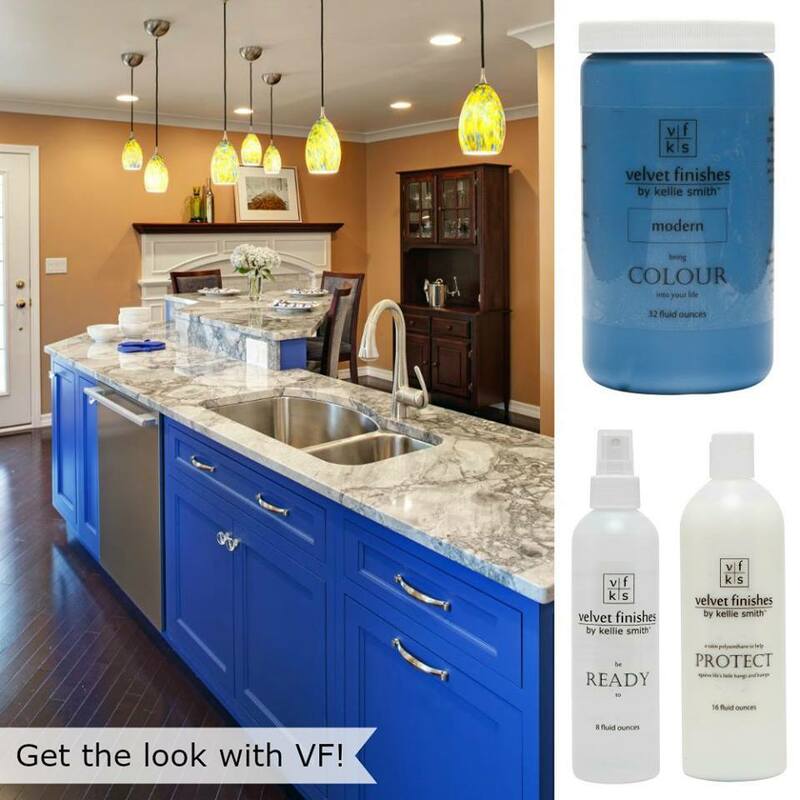 This energetic kitchen renovations ideas uses blue beautifully! 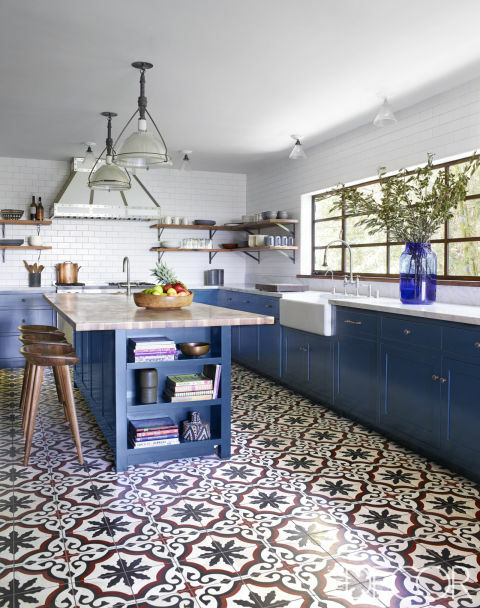 Could you dig blue kitchen cabinets in your home? 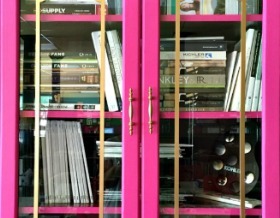 I’m a sucker for pops of colour in batroom vanities. Isn’t this space lovely? 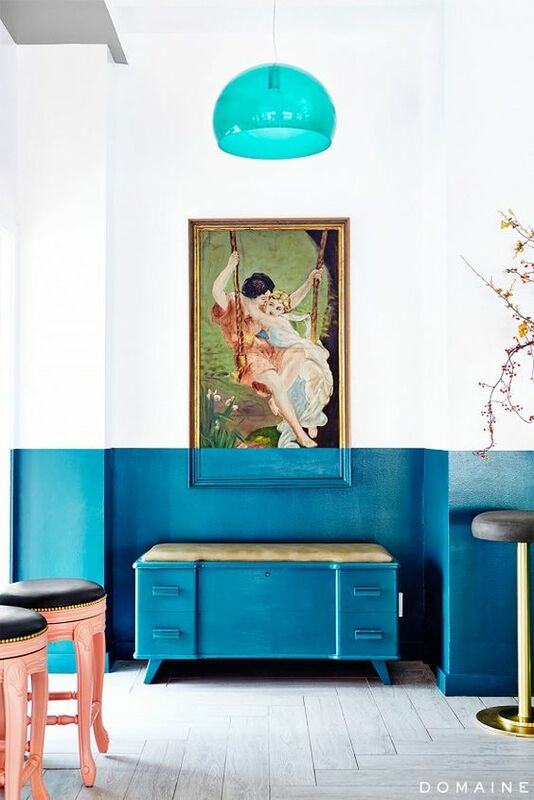 This vivacious blue hue and a charismatic mix of vintage and contemporary furnishings has my heart melting!! 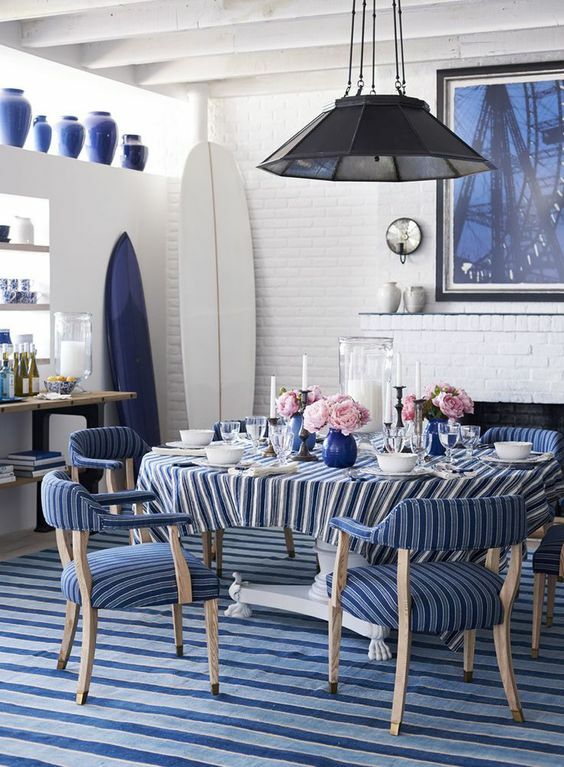 The mix of blues in this awesome dining room is quite impressive! Love it? 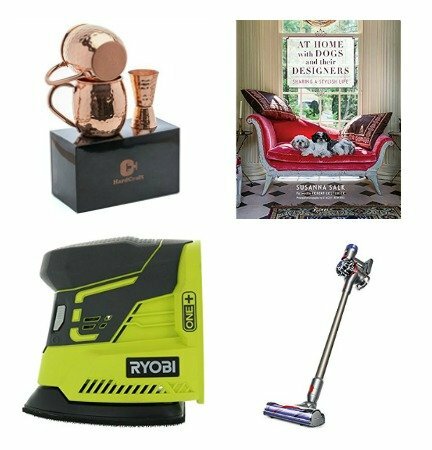 Do you know where you are going to use Modern in your home? 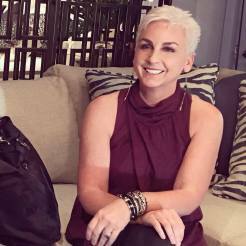 Please share pictures of your projects, I’d love to see! What a fantastic colour! 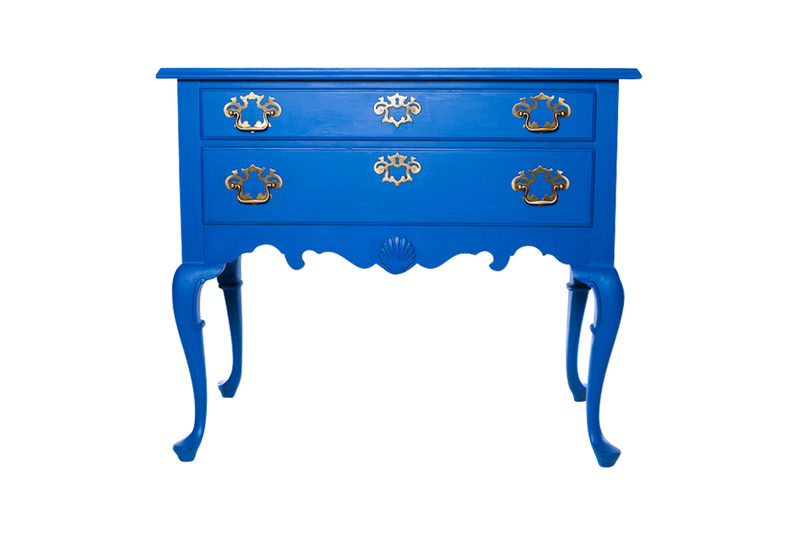 I recently painted my sons bed a deep navy blue but this colour is so energetic. I love it!